But back then, Gerlach's father was a jazz musician with an accessible studio in the basement of their home. Ian and Thomas talked music incessantly, quickly discovering their similar ambitions and tastes, which they spent the rest of their youths recording onto cassette tapes and sending out to labels. 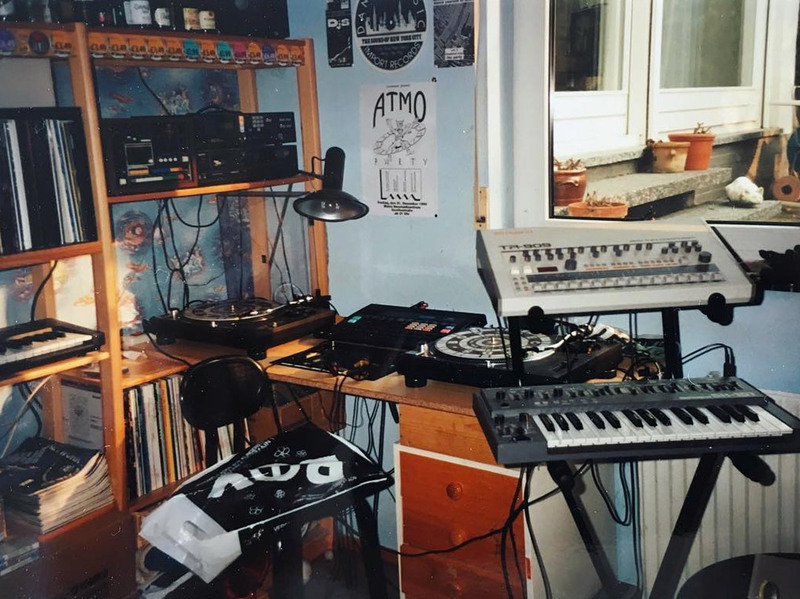 Earlier this year, I stood in Ian's skylighted Berlin kitchen watching him make an espresso as he spoke about those pre-Ableton, floppy-disk-filled days. "We rehearsed and recorded in his father's studio day and night. It was so hard back then, we had to record a track in one take. We didn't have the money to do it any other way," Pooley says. But even if he did have the money, it doesn't seem like he would have done it any other way. Let me be frank: Ian is old-school. Ian is the kind of guy who believes in the beauty of gritty imperfection, who doesn't master his work for fear of losing its nuances, and who still uses his Korg Z1 synth like it's 1999. Ian is not just a musician, or producer, or DJ, or label. He's a collector. He's a music machine historian who still has (and uses) the very first drum machine he ever owned: a Yamaha RX7 he got for Christmas in 1987. Along the way, he's kept nearly every piece of equipment he acquired. Before we went down to his studio, Ian gestured over to his living room, "That's where I make some of my best work." 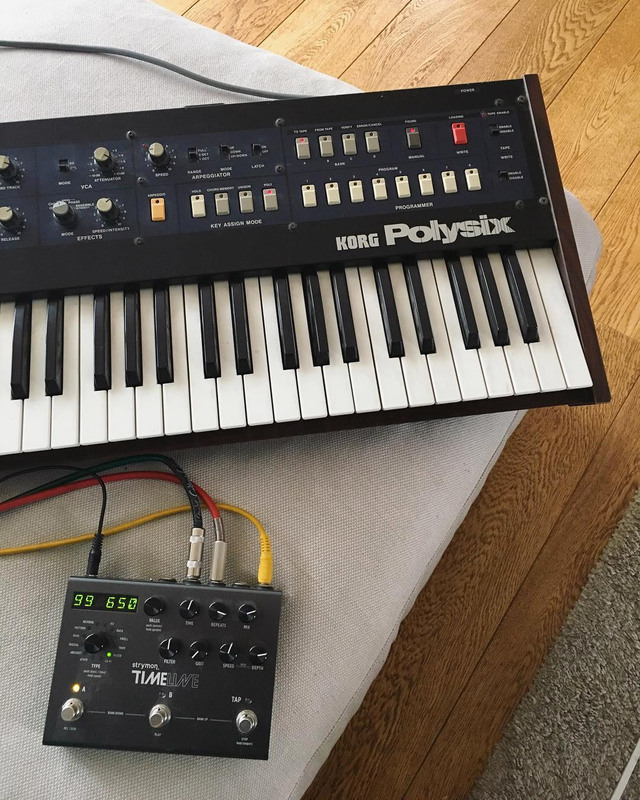 Sitting casually on the sofa were two things: a laptop and a vintage Korg Polysix synthesizer. "This is how I like to work," he explains, "minimally." A few times a week Ian chooses one piece of equipment to bring upstairs and play with—sometimes a synth, sometimes a drum machine. 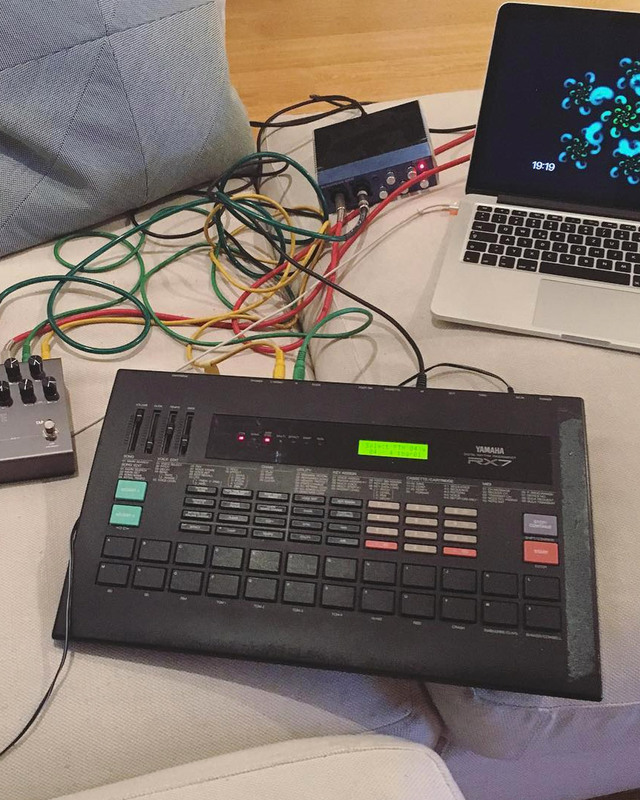 He calls these his "sofa sessions," during which he finds inspiration through limitation, creating loops and beats that he can later take downstairs to his analog playground. Ian and Thomas' cassette recordings got them signed to Force Inc., a famous Frankfurt-based label, in 1991. Under the names T'N'I and Space Cube, they played everything from house music to harder, edgier techno-breakbeat fusions. Ian stayed with Force Inc. for eight years and played both locally and internationally during that period. "We were very busy," he tells me. "You have to understand that in '91 the scene exploded. There was nothing. Nothing! Most of the clubs were run by American GI soldiers. We played for them a lot." From there, Ian worked with a couple other labels, predominantly V2, and eventually started his own label, Pooled Music, in 2003. Along the way, he became increasingly famous for the Brazilian influences he worked into his music, particularly in his 2000 album Since Then..
"I think I heard [Brazilian music] from my parents when I was young and it just never went out of my head," he says. "I like the syncopated rhythm, the warmth, the language, the feel. '60s, '70s, and maybe '80s Brazilian music just clicked with my work." Downstairs, Ian's studio encircled him as he took me through his collection one by one. He began with the pieces he uses most frequently, but surrounding me were bookshelves of vintage gear, like the Pioneer SR 202w reverb amp and the 808's grandfather, the Roland CompuRhythm CR-78. 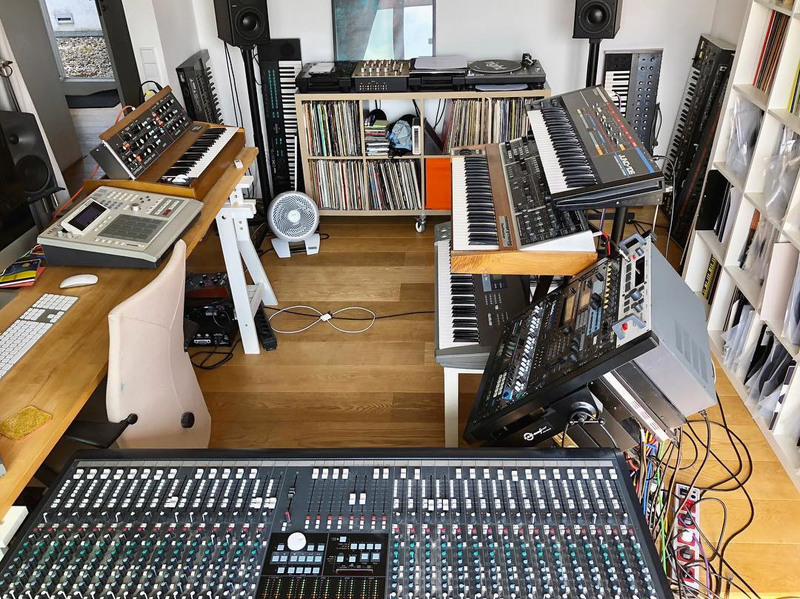 But his MPC3000 sits front-and-center, never on rotation. "I got this the year it came out, 1996," he says. 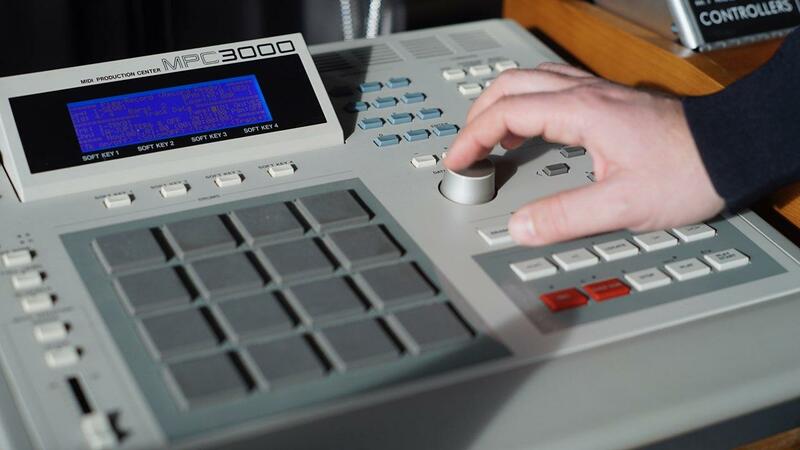 "I start everything on the MPC. Everything—synths, basslines—goes through here before I record them into my computer. My way of working is a bit complicated because I don't store my kicks, or hi-hats, or anything on here. I have a case full of records and I'm like, 'OK I like the hi-hats on this record, the snare on this one,' etc. Then I extract. I sample them to the machine, then slice them up and make my beats with them." This is one of the many reasons Ian's music retains such an authentic, unique sound. Tiny background noises from samples (which he used to record on to floppy discs and then load on to his MPC) often end up in Ian's beats, and he likes it that way. He can pitch them down, of course, or make them shorter, but these are the tiny bits that keep his music sounding so alive. His computer doesn't come in until way later in the process. He told me about how people laugh at him for still using such outdated equipment, often asking why he doesn't just work off of software. "But I can't stand sitting and using a mouse to adjust volume or add delay," he says. "I want to do this on my own and while I'm listening to it. The same people always come back within some years, though, and regret selling all of their old machines. People say, 'The new MPCs are more compatible, they're USB, they have an internal hard-drive, etc.,' but this is what everyone had: The MPC 3000. All the big hip-hop producers, everyone. I love it." 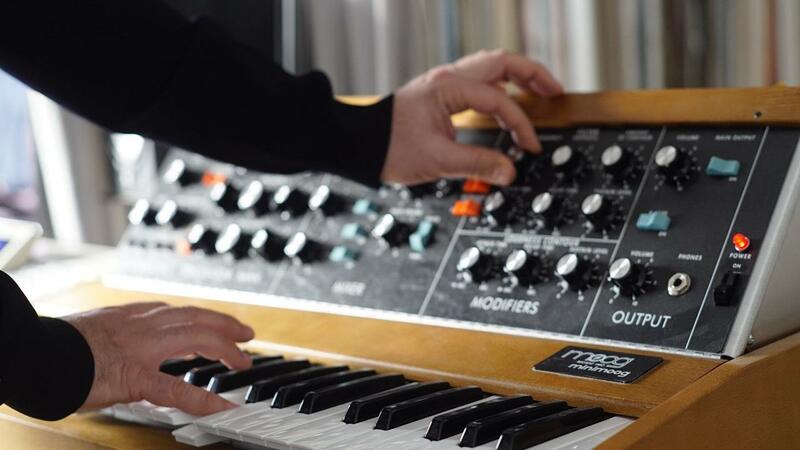 With that, he put his hands on the Minimoog. It was one of the first synths made for easy transport—and upon its original release in the late 1960s, was a piece of art—but it took nearly 30 minutes to warm up. This particular reissue only takes about five minutes to get going and then can transport you into rich dreamscapes. Ian admits that he doesn't need this piece, yet he uses it daily. He is obsessive about proper analogue circuitry. "You can buy a software copy of these sounds, but there are subtle differences," he explains. And when they add up, those subtle differences make a world of difference. When we finished gazing at the Moog, Ian ran me through a variety of other synths in his current setup: the Roland Jupiter-8, the Juno 106, an Oberheim Matrix 1000, and a Roland JV-2080. He plays around for a bit and I watch him lose himself among the characters he's collected. He adds a dubby ambience to the room with his Roland Space Echo and even gets his old AKAI S5000 running, adding a sweet crunch. Once he has a nice vibe going he visits his motherboard, a 32-Channel Soundcraft Ghost, twisting and turning knobs, bobbing his head as the setting sun streaks across Berlin. In the past couple of years, we've entered an analog renaissance—but unlike many musicians, Ian has no catching up to do. On my way out I spot a long, narrow box on a shelf among his other collectibles. Inside are 20 years' worth of samples, one floppy disk after another, after another.